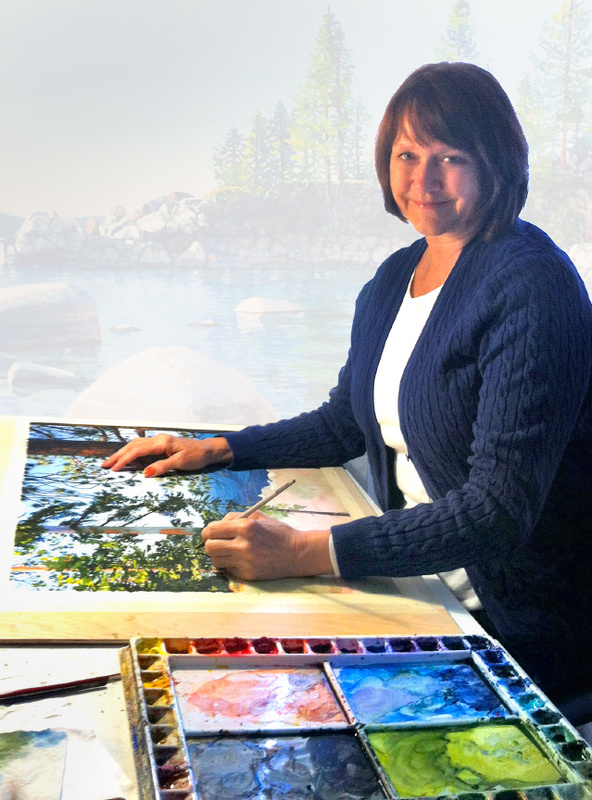 Lisa’s paintings have been inspired by the natural beauty and quality of light in the areas where she has lived including Colorado, Lake Superior, and now Lake Tahoe. Her art background has been in graphic design but she has always painted in watercolor. She is fascinated by the quality of transparency, both in the medium of watercolor and in the subject matter of her paintings. Lisa enjoys painting the clear waters and beautiful scenery near her and also exploring the translucent nature of crystal, glass, and backlit flowers and foliage. She has developed a representational style by the use of strong values, interesting color, and a high level of detail. Recently, Lisa has also been working in acrylics on panels and canvas. Lisa is a Signature Member of the National Watercolor Society, the Transparent Watercolor Society of America, and the Rocky Mountain Watercolor Society.